My girlfriend and I had planned a Girl’s Trip to the east coast and Corning, New York and unfortunately Hurricane Sandy hit the east coast just prior to our trip. But, we enjoy adventure and didn’t want to postpone our trip. We arrived in Newark and traveled to Brooklyn, then to Manhattan then went on to see the countryside. We had a blast on this trip! We weren’t sure there would be much to do in Corning, New York, but after we were there, we wished we would have planned more time to stay in this quaint little town. Our lodging was at the Halcyon Place Bed and Breakfast that catered to our dietary needs and of course was very homey. The Halcyon Place was just a short distance from Corning, NY in the countryside. We had 2 main events we wanted to do in Upstate New York on our Girl’s Trip. We wanted to see the Corning Museum of Glass and do a Wine Tour along the Finger Lakes area. The first attraction for our Girl’s Trip was to see was the Corning Museum of Glass. We had pre-arranged a full day of glass blowing classes at the Hands On Glass Studio and spent the day making ornaments, glass flowers, pumpkins and so much more. I can’t say enough about how fun those classes were! 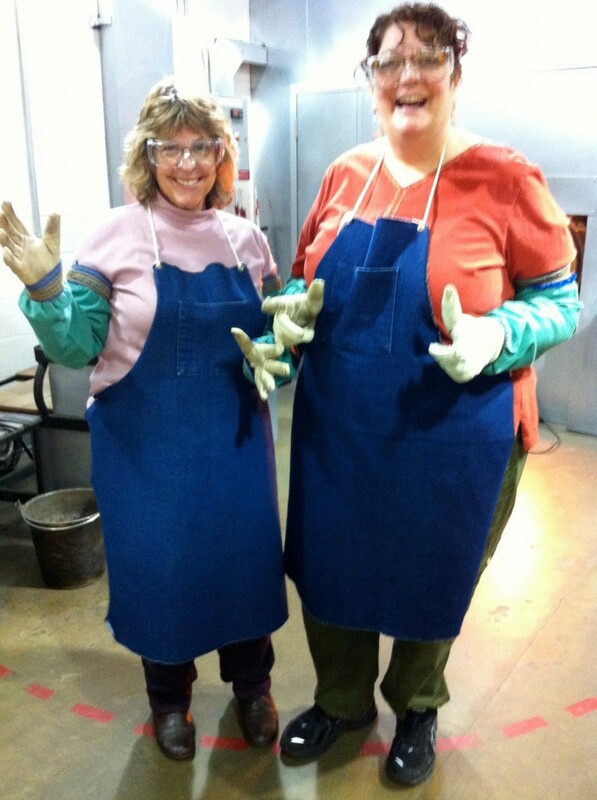 The photo below shows us prepared to blow glass! If I lived nearby, I would be there every month making things! After our classes and touring the Corning Museum of Glass, we ate at a great Indian Restaurant called Thali of India. If you are traveling through Corning, NY and have a chance to stay for dinner, I highly recommend this place. Their service was great and the food divine, the ambiance was delightful. What better thing to do on a Girl’s Trip than to go on a Wine Tour? That’s what we thought! I had no idea there were so many wineries in upstate New York! 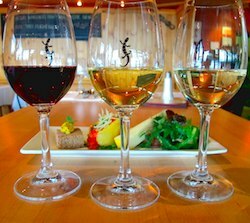 There are Cheese Trail Events, Chocolate and Wine Trail Events and so many more Trail Events in the Finger Lakes Region. It’s not right to drink and drive, right? So we hired a driver to take us on our Wine Trail Tour. We were lucky enough to get tickets for the November Deck The Halls Wine Trail Tour! What fun we had, food pared with wine as we collected holiday ornaments from each Winery for a grape wreath that was provided for us. Having a driver to ourselves was very nice, we could stop at the wineries we wanted to and stay as long as we wanted. I must say, I bought quite a few bottles of wine and brought them back to Alaska. They lasted from December through May, and enjoying the wines on a cold Alaskan evening brought back wonderful memories of our Girl’s Trip. Stay Tuned for more adventures of our Girl’s Trip. How cool! I’m obsessed with Glass Blowing!! I would love to learn how to. Most of my trips associates with San Diego and Fox car rental company. Firstly, when I rented a car from them, there was a little tricky to locate where to leave the car for drop off. But, then, I had a great experiences. My rental SUV had plenty of room for my loved ones in the back seat. Moreover, there was plenty of room in the hatchback for our suitcases. No hassles and cheap prices. Would you like to spend the most memorable vacation in San Diego – choose Fox for rental!